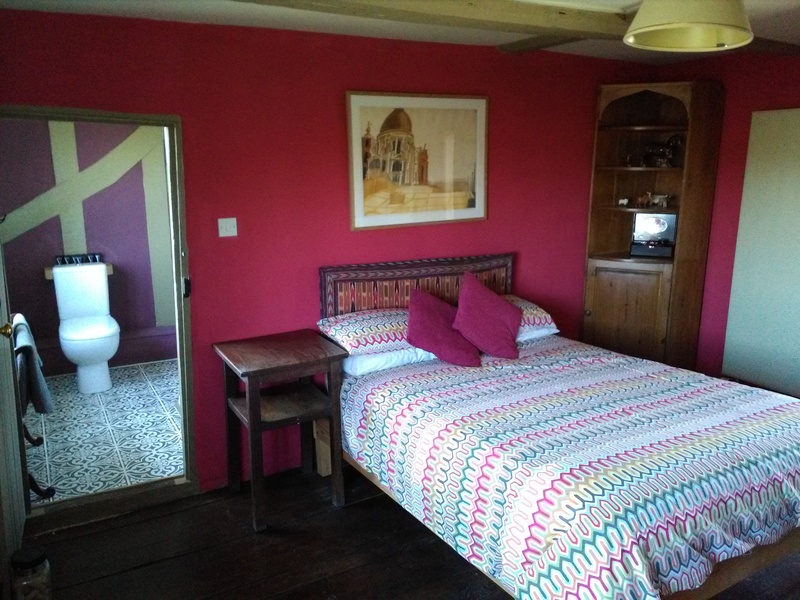 At Thurstons Farm we have a selection of bed and breakfast rooms, varying in size and style but we always aim to make your stay as comfortable as possible. All rooms have Wifi, flat screen televisions with inbuilt DVD players, Tea and Coffee making facilities and various additional options you can also choose from a selection of DVD’s and books in our guest library. All breakfasts are served in the farmhouse breakfast room – separate from the Stable conversion, just a short walk down the drive. There are beautiful views of the garden and being set within the main building a chance to experience the real period feel of the property with its low beams, log fires and beautiful original features. Plus the breakfast is pretty tasty even if we do say so ourselves, all locally sourced produce and some even grown, picked and made by us. There is additional room for storage in the Courtyard and there is plenty of parking at the farm. 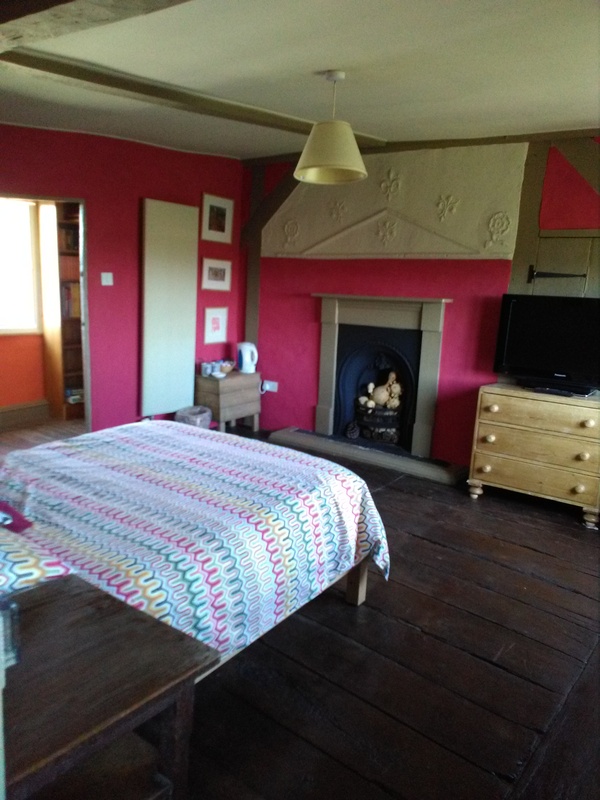 A double bedroom in the Stable conversion, providing the advantage of access at any time (ideal for those returning from late night parties) There are secure storage cupboards for walking boots and any extras you might need, a good size en-suite bathroom with shower. The room has views over the rear meadow and the Barn courtyard. 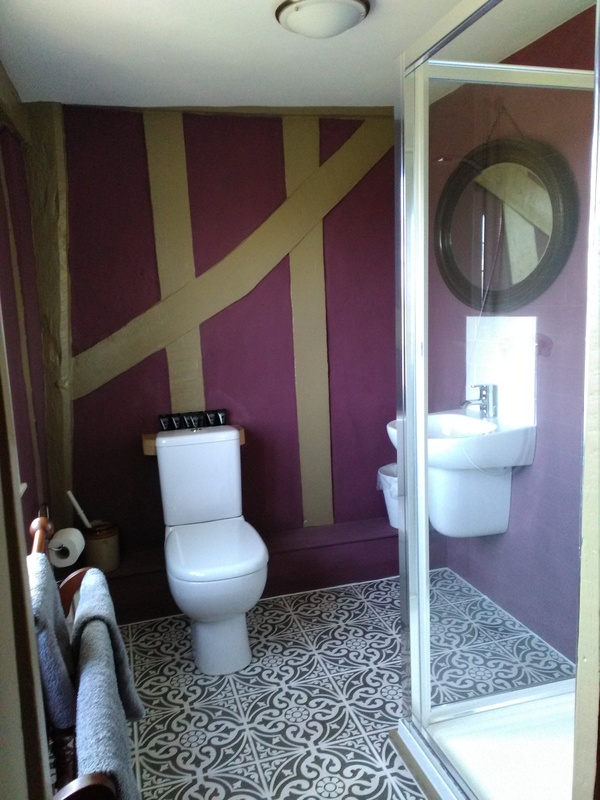 A twin bedroom in the Stable conversion, providing the advantage of access at any time (ideal for those returning from late night parties) There are secure storage cupboards for walking boots and any extras you might need, a good size en-suite bathroom with shower. The rooms has views over the rear meadow and the Barn courtyard. Located within the farmhouse the room is full of original beams and stud work which means you may need to mind your head on occasions, but it gives a real feel of the property and beautiful views from two angles onto the garden and surrounding farmland. This is a double bedroom with a private bathroom and private access area. There is additional storage space for coats shoes and other items, with an original mullion window overlooking yet another angle of the gardens. Located within the farmhouse the room is full of beams, charchter and a Tudor Plasterwork panel which means you may need to mind your head on occasions, but it gives a real feel of the property and has a beautiful viewof the back garden and across the surrounding farmland. This is a double bedroom with a private bathroom. We can also offer large sleepover space within the barn should you want to bring a large group and your own sleeping equipment, bathroom facilities and a kitchen area within the barn will be available for use, please contact us about this for more information. Please click here to find out more about our terms. If you would like to book with us please contact us.